Land clearing, especially for vineyards, can be a formidable task. Natural obstacles such as terrain, timber, brush, stumps and rock all create unique challenges when preparing acreage for domesticated use. Matt's background as a third generation logger has given him years of experience dealing with the often treacherous conditions and has enabled him to modify and build much of our own equipment to assist in our operations. 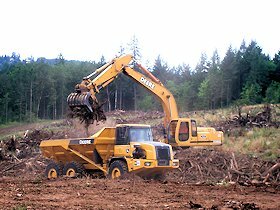 Using the Hitachi 370 equipped with a stump shear is central in our land clearing process. Splitting the stump means less roots left in the ground and a cleaner stump for burning or grinding.